Welcome to South Uist. This modern well looked after house is located in North Boisdale. This is a 2 bedroom house with a modern kitchen and large living room. One double bed and one single bedroom both with a skylight with wonderful scenery and perfect for letting in sunlight. There is a bathroom with shower and toilet downstairs. The living room has a sofa, TV with Digibox and DVD player. Broadband is provided. 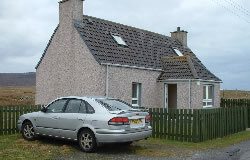 There is space for 3 cars on the property and more available on the public road. Cutlery, crockery, pots and pans are provided. There is also a washing machine, fridge, freezer, and an outside washing line. It comes fully furnished with modern and comfortable surroundings. There is a large garden both at the front and at the back. Please feel free to browse through the pictures. You can email if you have any requirements and we will endeavor to get back to you within 24 hrs. It is available to rent on a weekly basis and deals are possible on longer term contracts. A £100 deposit is payable to reserve the property and full payment is due at least one week before arrival. Electricity is deducted from the deposit and a cheque will be returned within 10 working days after check out. Check in is available from 15:00 on Saturday and check out 10:00 on Saturday.